Flight Day 9 saw Dextre moved to the Destiny lab, stowing the assembly pallet and a group dinner in the Zvezda module. Finishing assembly of Dextre and delivering spare parts to the station occurred during the spacewalk on Flight Day 8. The space station's handyman robot Dextre flexed its arms for the first time during Flight Day 7. Roaring into space from a sea-based mobile platform, a powerful direct-to-home broadcasting satellite was delivered into orbit Wednesday to expand DirecTV's lineup of high-definition television programming in the United States. Fastened atop a Zenit 3SL rocket, the 13,058-pound DirecTV 11 satellite began its ride into space at 2248 GMT (6:48 p.m. EDT) Wednesday with a blastoff from the Odyssey launch platform stationed along the equator in the middle of the Pacific Ocean. Managers delayed the launch from Monday to review a technical issue, according to a statement by Sea Launch Co., the launch service provider. The Ukrainian-built Zenit's first stage engine, producing 1.6 million pounds of thrust, lifted the rocket through overcast skies to an altitude of more than 225,000 feet during the first two-and-a-half minutes of the flight. The booster's second stage took over for a six-minute burn, before giving way to the Block DM-SL upper stage nearly nine minutes after launch. The Russian Block DM-SL engine put DirecTV 11 into a preliminary orbit 13 minutes into the mission. After a half-hour coast, the kerosene-fueled stage fired again for seven minutes to reach the planned geosynchronous transfer orbit stretching from a low point of about 155 miles to a high point of 22,671 miles. DirecTV 11 was released from the upper stage 61 minutes after launch, and Sea Launch officials hailed the mission as a success. But it was expected to take several hours for a South Africa ground station to receive the first signals from the satellite. "We're proud of our role in (DirecTV's) continued success as they roll out their high-definition service," said Rob Peckham, Sea Launch president and general manager. Next up for DirecTV 11 will be a series of burns using the spacecraft's on-board propulsion system to reach its final orbit in the geosynchronous belt along the equator at 99.2 degrees west longitude. The spacecraft will also deploy its twin power-producing solar array wings. The panels span 158 feet tip-to-tip. "We still have a lot left to do with the satellite," said Phil Goswitz, DirecTV vice president of space and communications. "We've got to do our orbit-raising, and then our deployments and our in-orbit testing, so...we'll have many of these heart-wrenching moments, but it's all exciting and we'll make this a success for our subscribers." Designed for a 15-year mission, DirecTV 11 will use a multitude of Ka-band communications instruments to reach the company's 16.6 million customers across the United States. The craft contains nearly a dozen Ka-band reflectors, including two large antennas 9.2 feet in diameter. 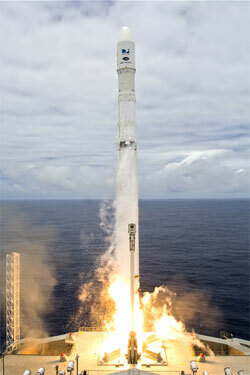 The satellite was built by Boeing Co.'s commercial satellite manufacturing division based in California. The craft is based on the company's Boeing 702 satellite bus. DirecTV 11 and DirecTV 10, a predecessor launched last summer, will significantly increase DirecTV's high-definition television programming across the country. The two satellites will allow DirecTV to broadcast local HDTV channels to 90 percent of its customers, according to Boeing. Goswitz said each DirecTV satellite beams about 750 channels to customers, but only about 70 channels are broadcast across the country. The others are mostly local network affiliates and regional channels. DirecTV 11 is the fourth high-definition broadcasting satellite in the company's fleet, and the craft will double the number of local markets served by DirecTV's network of HDTV channels, according to Goswitz. The satellite will also allow DirecTV to switch more nationwide channels to HDTV. "We currently have almost 100 channels of high-definition, like ESPN and HBO and Disney and all of everyone's favorites," Goswitz said. "DirecTV 11 will add an additional 50 channels to that. "By the time (DirecTV) 11 is up and in orbit and operating, we'll have 150 channels of high-definition and we'll have 150 markets of local (HDTV) channels," Goswitz said. 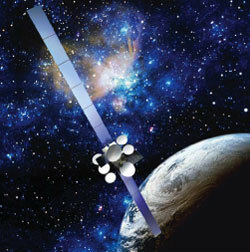 Boeing is also manufacturing DirecTV 12, a sister satellite that will further supplement the DirecTV fleet's capacity. The launch of DirecTV 12 will bring the total of national HDTV channels in the company's lineup to about 200, according to Goswitz. Catalysts for the increased use of HDTV broadcasting satellites by DirecTV and rival DISH Network have been the explosive growth of the market for high-definition television sets and a leap in space technology. Goswitz said the development of high-power satellites allows spacecraft to transmit sharper video to receiving dishes at homes and businesses. "Everyone has contributed to basically doubling the business, especially with respect to the satellites," Goswitz said. "That kind of vivid detail and color with high-definition takes five times the satellite capacity to do what we used to do for standard video." 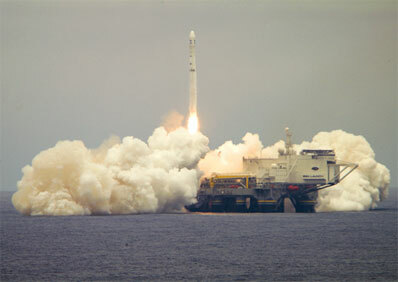 Sea Launch will next turn its attention to the first mission of the company's Land Launch subsidiary, which will use modified Zenit rockets flown from the Baikonur Cosmodrome in Kazakhstan. Land Launch's inventory includes both two-stage and three-stage rockets tailored for low Earth orbit and geosynchronous orbit delivery missions, respectively. The first Land Launch rocket, known as the Zenit 3SLB, rolled to Baikonur's Complex 45 last month to begin several weeks of pathfinder activities. The tests included fit checks between the booster and the pad, countdown rehearsals, and filling the launcher's three stages with liquid oxygen, according to Roscosmos, the Russian space agency. Testing successfully wrapped up last week, and the rocket returned to its assembly building for final pre-launch preparations, which will include receiving its 3,300-pound satellite payload. The Zenit 3SLB will launch the Israeli AMOS 3 communications satellite, which will facilitate communications between the United States, Europe and the Middle East. The first of three Land Launch missions on the books for this year, the flight is scheduled to get off the ground in late April or May, said Paula Korn, a Sea Launch spokesperson. Four more Sea Launch missions are also scheduled for the remainder of 2008, with roughly one launch every other month, Korn said. The next Sea Launch flight is expected in May with the Galaxy 18 communications satellite for Intelsat.